I made another stop at the Larkspur farmers market to pick up some oysters from one of my favorite seafood vendors, Santa Rosa Seafood. I can’t rave enough about how amazing this vendor is for its fresh seafood! I know I missed the open house but I thought this would be perfect for me. When we arrived at the market, we saw the different varieties, and we felt a little lost at first, but I just asked the people working there and, as usual, they were more than happy to help. He started explaining to us the differences but, when I started asking about the taste, he just said, “Wanna try them?” Of course we did! We tried three different kinds; one was smaller, briny, and not very juicy whereas the other two were more up to our speed having plenty of juice and a little more substance. We got a variety of the two bigger ones then stopped at the grocery store and picked up two bottles of our favorite champagne before returning home with our succulent prizes. Oysters, of course, need a delicious sauce. This mignonette recipe was inspired by one I tried at a restaurant. I fell in love with the idea as soon as I saw pomegranate mignonette sauce on the menu. While we were devouring the oysters, one thought came into my head; I can do this much better and this recipe was born. We had received a small and beautiful pomegranate of the deepest ruby red in our produce box and I knew I had the perfect chance to make the mignonette sauce. The oysters in mignonette paired with one of my favorite rosés, a moderately priced Chandon, made a splendid evening. You too can experience a memorable Valentine’s Day with this recipe. The pinks fit the romance theme and the champagne, as well as the lush oysters, creates a delicious pre-dinner course, or a heady addition to an otherwise plain surf and turf menu. You know what is said about oysters and aphrodisiacs, but you can find out for yourself! Measurements are estimates that vary depending on quantity and size of oysters. White balsamic vinegar – Don’t panic or worry, you can use any vinegar you want. I bought this from a winery so it might be hard to find. However, you can just go to the vinegar section of your local grocer or, better yet, a gourmet foods store and find something that sounds good to you. I have used citrus champagne vinegar before and it was good. A regular champagne vinegar would work just fine too. Bottle Rosé Champagne (mostly for drinking!) - In my home, we have a rule that champagne bottles come in pairs. Keep in mind that a bottle only has about 4.5 glasses. Using some of that for the oysters will not leave much left over for sipping. Step 1. In a small bowl muddle the ½ of the pomegranate seeds, then add the shallot, vinegar, salt, & pepper. Mix, taste for quality, and adjust seasonings/ingredients as needed. Step 2. Cracking open an oyster. The vendor at the market gave us a quick lesson on how to do this. Look at the back and narrow part of the oysters and find the hinges. There is small slit like gap. This is where the knife goes. Each one is different and some were easier than others. 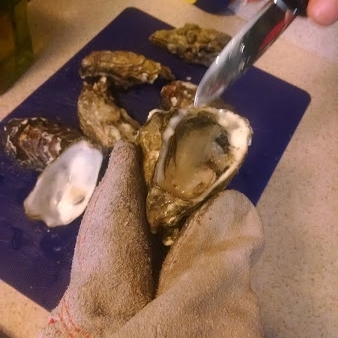 Take your oyster knife and, using a non-slip glove to protect your hands, hold your oysters firmly in place in a flat surface. 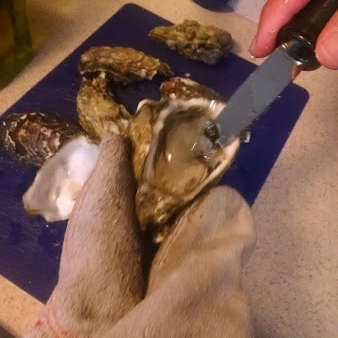 Stick the knife in the slit, firmly wiggle it in there, and once it feels like you have it wedged, give the knife a little twist to open the oyster. Here’s a great video example. hen take the knife and run it under the opened oyster to loosen it but leaving it in the half shell. Step 3. Plate all the oysters, sprinkle some of the reserved pomegranate seeds with the mignonette sauce on the oysters, pour a glass of bubbly for everyone and you're ready to dig in. Take an oyster, spoon some of the sauce over it, and slurp it down in your sexiest way possible. Chase the oyster down with a sip of rosé and wait for the party in your mouth to begin. I also recommend pouring some of the champagne over the top of the oysters with the mignonette. I really hope you'll give this recipe a try and whether you enjoy it by yourself, with a lover, or friends share it with us!